We take a look at some of the display trends we observed at CES 2019 and how FlexEnable’s Organic Liquid Crystal Display (OLCD) technology plays part in these exciting changes. Product teams are going for a “bigger is better” approach to screen innovation. For example Bosch has taken a new approach to solving the problem of screen limitations by introducing projection technology that can potentially convert any surface into a touchscreen. We really liked the Mui internet-connected block of wood shown by a company called Nissha - it offers a change from the usual kind of display and seamlessly blends into a home’s interior as furniture, and not a device. At FlexEnable we also believe in the importance of displays and smart interfaces being either unobtrusive or beautiful in their own right. The OLCD we have developed allows designers to integrate displays into products with different shapes and sizes without compromising design aesthetics – the display can be curved and bent around surfaces. FlexEnable’s OLCD technology adds freedom to car design as well as to the future smart home. LG’s rollable TV has already generated a great deal of positive coverage due to its stunning design and great performance in media demos. Now this product is expected to move from concept to consumer product, with plans for public release by end of 2019. We are curious as to what the price tag of that TV will be. 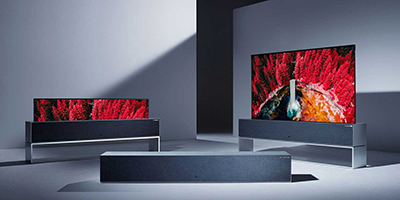 While it is not aimed to be released for sale, one of the most impressive installations of this year’s CES was arguably the “Massive Curve of Nature” by LG which is composed of around 260 55-inch OLED TVs. Among other products, Samsung showed at CES an updated smart fridge which according to Samsung: “It’s more than a fridge. 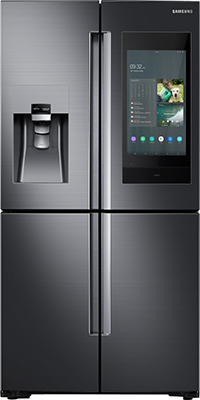 It’s the Family Hub.” The fridge features a new “canvas” (screen) where family members can leave photos and notes by uploading them from their smartphones, as well as use Bixby to order an Uber, check who is at the door or find a recipe. Another smart home device that captured our and the media attention was the “Cleer Mirage”, a speaker with a sleek design that’s supporting Amazon Alexa. 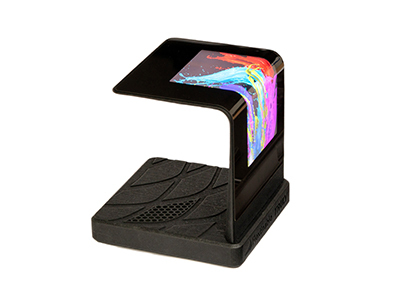 It comes with a curved 7.8-inch AMOLED screen that wraps around its cylindrical form, displaying videos and images. As a complementary technology to flexible OLED, OLCD can be used in applications where OLED is not suitable either because of the display requirements (such as long lifetime and/or high brightness) or because of production costs (large area flexible OLED displays are very expensive to manufacture today). Our blog explains more about the differences between flexible OLED and flexible OLCD. The continued development of the 2-in-1 and touchscreen laptop market also points to an ever-shrinking footprint with ultra-thin profiles and bezel-less displays. Lenovo launched their newest addition to their Yoga-series which comes with a screen that almost goes edge to edge, with the glass disappearing into the lid. 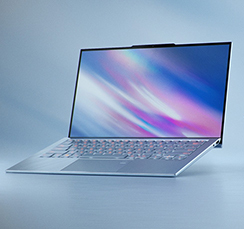 At the same time Asus revealed its new ZenBook S13 that has a display with a 97 per cent screen-to-body ratio and bezels that are only 2.5mm thick, leading to Asus to claim it has the world's thinnest laptop screen bezels. As FlexEnable’s strategy director, Paul Cain, explains in his article: “the trend for smaller borders is not only about device aesthetics; consumers want larger displays without necessarily having to carry a larger device”. OLCD brings huge value not only in conformable and shapeable displays in smart home, automotive and beyond, but also in flat-display applications like notebooks where borderless means bigger displays for the same sized notebook. Finally, the Royole FlexPai, being the “first foldable phone” to be presented at CES, has taken up quite a bit of the media spotlight showing that foldable screens are exciting for consumers. It is rumoured that bigger competitors like Samsung and LG aren’t too far behind in showcasing their own bendable smartphones with more anticipated for Mobile World Congress in February. With CES 2019 already in the past, the future of flexible display technology looks bright. Yet, we think that flexible, curved and foldable screens needn’t be reserved for smartphones alone. There are many other applications where these are needed and can unlock design freedom, and open up new use cases. Thanks to its unique features plastic OLCD can address new markets, transforming the cost structure of flexible displays and changing the way we use displays in our daily lives.